This is certainly one of my favorite tea cups in my collection. I found it at a garage sale, and would have passed right by it, had my husband not pointed it out to me. I love the beautiful artwork and the unique shape! Simple red roses framed with black lacy boarders. The tea cup is perched on a cute little pedestal! This cup makes me smile when I use it! I'm joining Martha's Favorites and Artful Affirmations for another Tea Cup Tuesday. Apparently there are few records of the Hammersley family china manufacturing that show the pattern names and numbers. I'll have to see if I can't find more information. Tara, I totally love your cup! It is not often we see cups like it. The coloring and the flowers are really gorgeous, and I love that it has a pedestal. Thank you so much for sharing it with us. Give your hubby a pat on the back for me "Well done!" 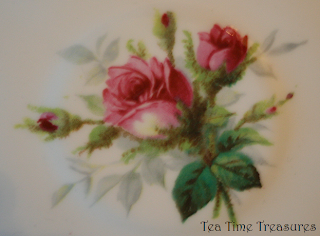 You have a beautiful and lovely blog full of precious Tea Cups!!!!!!!!! Beautiful cup! It would make me smile too! (It did make me smile!) Happy tea day and Happy New Year! Tara dear, I do love this teacup! you are right, very unique artwork. some more in black colour with roses in the center! stunning is the key word here! love love love it!